The iPhone Clock app has replaced many bedside alarm clocks out there, fitting since many of us sleep with an iPhone on a bed stand anyway. While most users know that you can snooze / sleep the iPhone alarm by just tapping on the screen or pressing one of physical buttons on the phone (volume buttons, home, power), fewer know this handy little trick to quickly turn off the alarm completely. 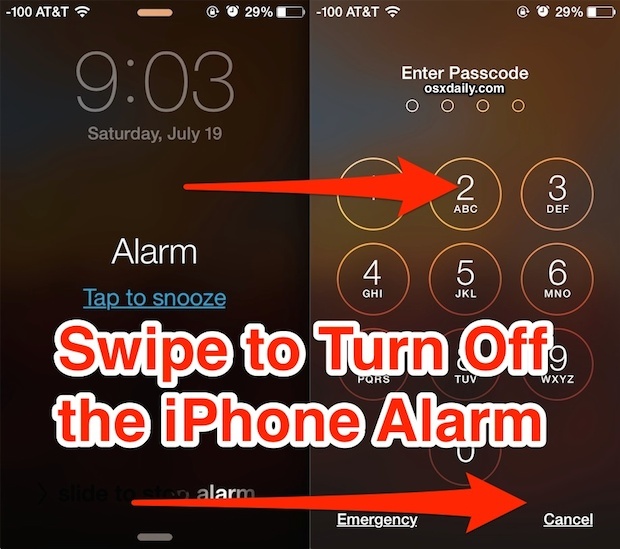 All you need to do turn off the alarm clock is swipe to unlock the iPhone. This is different than what most users do, which is to swipe to unlock their phone and then enter the passcode, under the assumption that the entire sequence is necessary to turn off the alarm for the day rather than simply snooze it. But all of those steps aren’t necessary to disable the iPhone alarm clock from blaring sounds and noise, instead all you need to do is swipe to unlock the phone. That’s it. There’s no need to enter the passcode and actually unlock the phone to shut up the alarm, just swiping to the pass locked screen alone is sufficient to disable it. This is actually what the little swipe text says if you look carefully at it, not that you’re spending much time reading the swipeable text at 6:30am when you’re late to work, but it’s there. The obvious downside to learning how easy this is is the potential for oversleeping, at least if you’re like me and have a tendency to fumble around in a groggy state, since taking this to muscle memory could mean swiping to shut the alarm up and then a continued sleep through some important event… oops. So maybe it’s best remembered when the iPhone is sitting on a desk or dresser across the room, and not bedside. I assume that when you say, “…this handy little trick to quickly turn off the alarm completely.” you are describing how to turn off **the current instance** of the alarm, not how to turn off the alarm completely so it won’t go off ever again. I’m a iOS 9.x refugee from the now-discontinued Yocto Clock, and couldn’t find any decent multiple-alarm apps that run under the new iOS on the iPhone 6s other than this stock Apple app. Everybody says this and everybody is wrong. Why? Because I can never reach the phone in time to swipe to the right. If I pick it up, it goes dark. No swiping allowed. My one and only relatively fast solution is to tell siri to turn off my alarm. If the phone would not go black so fast, I would swipe the thing.